Pasteurised. Easy open pack. Sugarfree. Red Bull is a great energy drink to have by your side, and is appreciated world-wide by top athletes, students, and in highly demanding professions as well as during long drives. 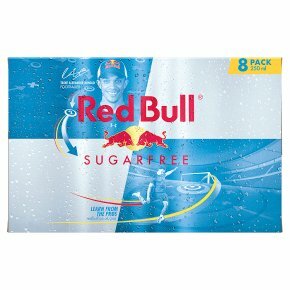 For those who need WINGS for intense meetings or creative brainstorming sessions, on the field with teammates or competitors, or simply want to get the most out of life, a chilled can of Red Bull Sugarfree Gives You WINGS. Without sugar. WHAT'S INSIDE THE CAN: Caffeine was well known for its stimulating effects by ancient civilizations who consumed it from natural sources like tea, coffee, cacao beans & cola nuts. Taurine is an amino acid, naturally occurring in the human body and present in commonly consumed foods. It is involved in a wide range of biological processes. B-Group Vitamins are essential micronutrients that are required for maintaining normal body functions. Aspartame & Acesulfame K are among the most-tested and most-used sugar substitutes worldwide. Alpine Water: Naturally, water is a key ingredient of Red Bull. Caffeinated taurine drink with sweeteners - high caffeine content. Not recommended for children or pregnant or breast-feeding women (32 mg/100 ml). Consume moderately.